The CEM DESFire 13.56MHz read/write contactless smart card can be used for a range of different applications from access control to other applications such as cashless vending and public transportation. It completes CEM's end-to-end DESFire solution by utilizing 3DES (Triple DES) encryption and featuring a pre-personalised card memory structure for customer convenience. Using a standardised Mifare Application Directory (MAD), the card contains a structured file system offering security for multiple applications and to support future growth. Utilising Advanced Encryption Standard (AES) -128-bit or Triple DES (3DES) encryption, the CEM DESFire card information is securely stored on the card, ensuring that the card cannot be cloned and that only valid cards are granted access. 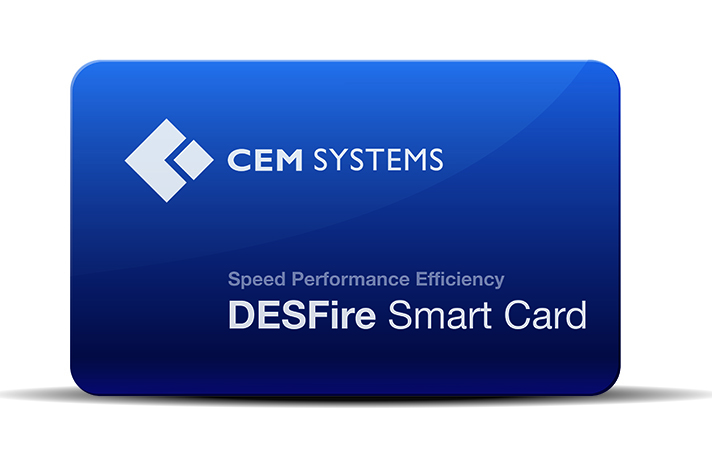 The CEM DESFire smart card delivers the perfect balance of speed, performance and cost efficiency when opting for a DESFire smart card solution. Featuring an on-chip backup management system and mutual AES or 3DES authentication, the CEM DESFire smart card is based on MiFare DESFire EV1 and can hold up to 28 different applications and 32 files per application. The size and access conditions of each file are defined at the moment of its creation, making the CEM DESFire Smart card a truly flexible and convenient product.